Did you know that when you start Med III you will have up to eight new classmates? Dalhousie medical school currently has two programs where students join for the clerkship years. There are dozens of internationally-educated physicians living in Nova Scotia who are not yet practicing here as physicians. Over thirty of those physicians are currently clients of Immigrant Services Association of Nova Scotia (ISANS), which helps international medical graduates (IMGs) to navigate the various pathways to licensure in Nova Scotia. ISIS has representatives on the IMG Working Group, which Dalhousie chairs. This working group identifies gaps and barriers to education and licensure for IMGs in Nova Scotia. The Government of Nova Scotia recently funded 10 additional seats at Dalhousie Medical School. Eight of those seats were added to the first year class. The IMG Working Group proposed that the two other seats would be added to the Med III year and that qualified IMGs could apply for the seats. This resulted in the IMG Clerkship Program, which accepted its first two students in the fall of 2008. Every year, the IMG Admissions Committee reviews applications and accepts two students into Clerkship. The minimum qualifications needed in order to apply include: one year of living in Nova Scotia, a passing grade on the MCCQE Part 1 (which requires them to have written the MCCEE), a grade on the MCCQE part 2 or other acceptable clinical assessment (although a pass is not required), and high scores on an English language assessment such as TOEFL iBT or CLBA. IMG Clerkship applicants also participate in the same MMI that all prospective medical students at Dalhousie complete. IMG Clerks have often practiced in a country other than Canada and may have been out of practice for a few years while working towards their Canadian qualifications. Many IMG Clerks have families and some have been living in Nova Scotia for several years. When you meet the two IMG clerks (who will join your class in Med III and graduate with you as Dalhousie graduates in Med IV) please welcome them warmly into your class! For more information on the program, please visit gho.medicine.dal.ca The IMG Clerkship program is coordinated out of the Global Health Office. After successful completion of Med III and IV, the IMG clerks become Canadian Medical Graduates and compete for residency positions in the first iteration through CaRMS. If you are interested in helping with the IMG Clerkship Program, please contact Brie Rhebein, Program Coordinator, at the Global Health Office: gho@dal.ca; 494-8054. Dalhousie’s partnership with International Medical University in Malaysia began in 1992, when IMU was founded. Students from all over the world can apply to IMU to study medicine, dentistry, pharmacy, and other professions. Approximately 40% of the medical school class stays in Malaysia to complete the full degree at IMU, and 60% of the students transfer to Partner Medical Schools around the world. Dalhousie is one of almost 30 Partner Medical Schools, many of which are located in the UK and Australia. As part of the partnership agreement, students cannot transfer to a Partner Medical School in a country of which they are a citizen or a permanent resident. Thus, Canadian citizens and permanent residents of Canada cannot apply to IMU and then complete their medical education at Dalhousie. The students transfer after completing 2.5 years of training in Malaysia. Dalhousie accepts up to six IMU students into Med 3 each year. So far Dalhousie has accepted over 80 IMU students! The IMU students currently arrive in May and complete the LINK Program during the spring and summer that is designed to help them transition into the Canadian medical system. During their first summer here, there are opportunities for other Dalhousie medical students to be involved with the program as buddies and peer tutors. In August, the IMU students start Introduction to Clerkship alongside the IMG Clerks and the Dalhousie students who have been enrolled since Med I. 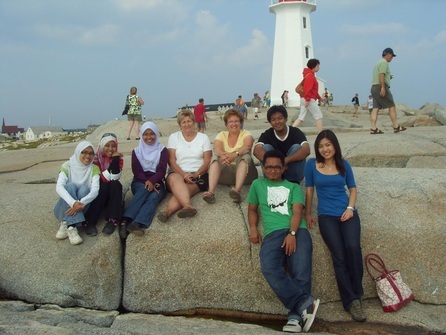 Reasons why IMU students want to come to Dalhousie include: the program is well supported (the IMU program is also coordinated out of the Global Health Office), students receive a lot of clinical exposure, students know they will be challenged, and the LINK program helps them prepare for those challenges. Because the IMU students are here on student visas, and are not permanent residents of Canada, they cannot apply for residency positions through CaRMS. Approximately half of the IMU grads return to Malaysia for postgraduate training while the other half pursue residency in the US. It is the goal of most IMU students to return to Malaysia; however, many prefer to do so once they have finished residency training.